As of September 1, 2017, all applicants seeking to apply for a US Visa (MRV) in Mexico MUST pay the US Visa Application Fee in cash in person at the bank in Mexico prior to finalizing your appointments for ASC and USC. You must first complete the DS 160, then you will receive an email containing a PDF with your personalized PIN and expiration date. You will be given a limted amount of time to pay this fee as noted on your PDF. You must pay the fee within the time frame, otherwise you will need to refresh the form and obtain a new PIN. Don't have or know where to get the PDF/PIN? Please click here for instructions: HOW TO OBTAIN PDF/PIN. PLEASE MAKE SURE YOU FOLLOW BOTH STEPS DESCRIBED BELOW TO AVOID ANY DELAYS IN PAYING AND/OR RECEIVING THE SCANNED RECEIPTS. Fill out the PREPAID US VISA APPLICATION FEE ONLINE REQUEST FORM. We will send you an online invoice to cover the costs associate with paying this on your behalf. Make sure all your information is correct before clicking "SUBMIT". This information is for our personal records and helps us associate your PDF to your file. Q: How do I generate the MRV Payment Instructions? Click here for answer. We will send you an online invoice via PayPal with the information you have submitted after completing steps 1 & 2 to complete your payment using your credit/debit card. Do NOT pay using e-check!!! Q: How do I calculate the US visa application fee in USD? A: Take the amount in Pesos and divide it by the current rate of exchange. Rates may fluctuate daily. 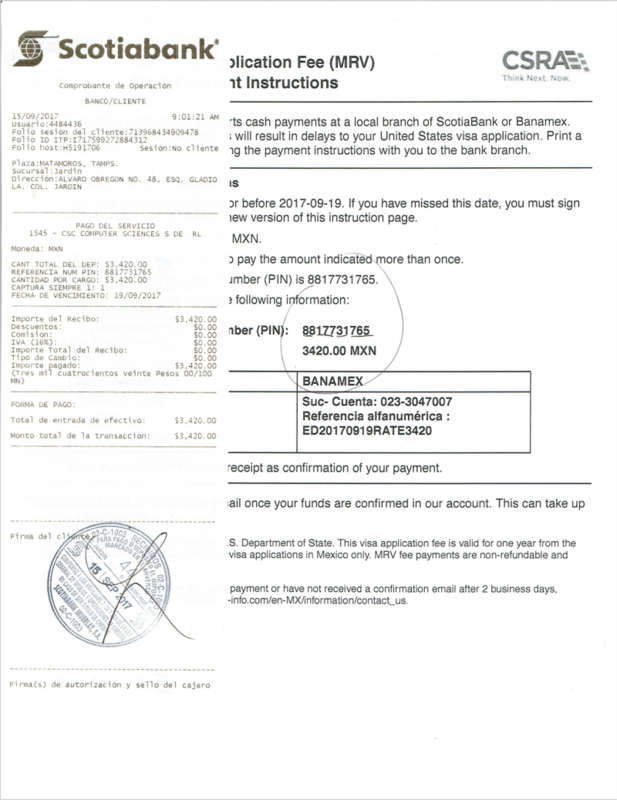 A: We go based on the actual amount that is in Pesos and shown on your MRV Payment Instructions PDF. If we take $190.00 USD and exchange it for Pesos based on the rate of exchange given above, as an example, then we will only receive $3,439.00 MXN Pesos. $190.00 USD X $18.10 MXN = $3,439.00 MXN Pesos. We will fall short of having the amount needed to pay at the bank now and have a remaining balance as shown below in MXN Pesos and USD. I hope that explains it! We are 100% transparent in our method of operation and will always present all information up-front to prevent any issues down the road. Pay the online invoice. All payments MUST be received by 7:30 A.M. CST to be guaranteed for processingon the same day excluding Mexican Bank Holidays. Payments received after 7:30 A.M. will be processed on the following business day (excluding Mexican Holidays). Some exceptions may apply depending on our schedules. We recommend being on stand-by after completing steps 1 & 2 as we can invoice you at random times of the day and possibly take care of your payment throughout the day. All US Visa fees payments received by 7:30 A.M. CST are guaranteed to be processed on that same business day excluding Mexican Bank Holidays. We will keep you posted on the progress of your payment and email you once it is completed. You will also receive a scanned copy of your receipt for your records. Your US Visa Fee will be paid on the following business day after receiving your payment, excluding Mexican Bank Holidays. Q: When can I book my dates after the payment is made? A: We generally see that our clients are able to book within hours of the payment made at the bank in Mexico. In some cases, it will be later that evening. We DO NOT recommend paying the US visa fees on Saturday's as we have shown it to actually take longer to update in the system, therefore, we do not pay on Saturday's. Please share this page with friends and family! Receive a $25.00 credit towards any Full Service Hotel/Transportation package for Matamoros for using this service! A credit will be issued in the form of a partial refund to the payment received for Hotel/Transportation Services. This applies to Full Service Packages for Matamoros ONLY at this time. - The payment MUST be made in cash / pesos in person at the bank. - The amount will vary depending on the current rate of exchange from US dollars to pesos. Your invoice will reflect the current rate of exchange given to us by the banks. $16.50 pesos to $1.00 US dollar = a cash payment of $224.55 USD each. $17.50 pesos to $1.00 US dollar = a cash payment of $211.71 USD each. $18.50 pesos to $1.00 US dollar = a cash payment of $200.27 USD each. $19.50 pesos to $1.00 US dollar = a cash payment of $190.00 USD each. Q: Why are you charging more than what the U.S. Consulate website says? Process of exchanging US dollars to Pesos / Pesos to US dollars. We take $1 US dollar and receive $17.50 pesos for it in return. We take $19 pesos and receive $1 US dollar pesos for it in return. This is just an example, but it is EXACTLY how it works! We initially sold our $1 USD and it cost $2 pesos more to get it back. That is how the Rate of Exchange businesses make their money. Rates vary and fluctuate depending on various factors that are out of our control. Our rates ALWAYS indicate the CURRENT rate of exchange. Please call or text us at 956-455-3628 if you have any questions and/or concerns. We are happy to assist you 7 days a week 10:00 A.M. - 9:00 P.M. CST. If we miss your call, we will return it in the order it was received. RUSH SERVICE is based on availability. $50.00 USD for the first visa fee + $10.00 per additional visa fee on the same PDF + 3% payment processing fee. This rate is set for 1 adult or families ONLY with 1 PDF and 1 online invoice. $50.00 USD for the first PDF/PIN/Visa Fee + $25.00 per additional PDF/PIN/Visa Fee + 3% payment processing fee. This rate is set for individuals that have 2+ PDF/PIN and pay using ONLY 1 online invoice paid at the same time/date. Separate trips made to the bank will not qualify for these rates. You will receive a scanned image of your receipt after our service is complete.